Bringing a new parakeet into your home is a stressful event, for both you and the bird. It will take time for your bird to acclimate to his surroundings and he may act agitated or restless during this transitional phase. Luckily for new bird owners, a few simple tweaks to the bird’s environment and your interactions can go a long way toward making the bird more comfortable. All it takes is a little patience and a gentle approach. Place your parakeet’s cage in a quiet area of your home, away from windows and loud noises. If you have a dog or a cat, try to block off the bird’s room to prevent those animals from stressing your new feathered friend out. This is also true for those with children—it is best to give the bird some time to adjust before introducing him to kids, and to ensure children always act quiet and calm when near the parakeet. Parakeets are social creatures and like a little attention now and again. Make a point of saying hello to your parakeet several times each day, always approaching in a calm manner. Your bird cannot understand what you are saying, but the overall theme should be “We are friends, and I’m not going to hurt you.” Use a warm tone of voice and smile when you talk to your bird to help him feel more at ease around humans. Your new parakeet needs a place to call home, and equipping that home with the right accessories can help keep him calm. You can cover your parakeet’s cage at night to instantly calm him down for quiet hours, and providing plenty of interesting toys, rotated every couple of weeks, will keep your bird’s mind engaged when he is without company. 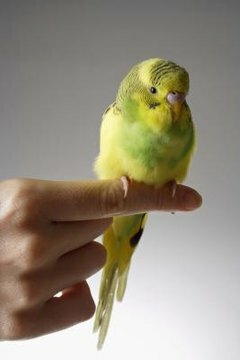 It is also important to make sure your parakeet’s cage is a good size; if he does not have enough room to move around, he will get anxious. It takes time for parakeets to adjust to new surroundings. Providing him with a safe place to live and approaching him with care will help speed the process, but remember to give your parakeet some room to breathe. Interact with him briefly a few times a day, but avoid overstimulating him during the first few weeks. Eventually your parakeet will adapt to your home and relax, but it is best to let him do so at his own pace.